We are again entering a collapse phase similar, yet far worse than we had in 2007-2008. I will show you a few graphs as illustration of weakness in the real economy and compare them to the financial bubbles we are living. The point to writing this piece is simple, the Fed has been saying they will raise rates. They truly need to in order to retain ANY credibility at all …just one minor problem, they cannot! Not only can the Fed not raise rates, it is my opinion the economy and in particular the markets will force them to embark in another “QE folly” shortly. I believe this will be the final shot of QE administered and may be seen by historians as “QE 4(n)evermore”. As you can see, we again sit with record margin debt, you already know what happened in 2000 and 2008, do you really wonder about 2015? 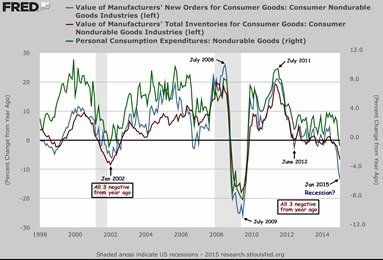 Now, let’s again look back at what I believe are very good leading economic indicators: inventories, new orders and personal consumption. All three series have now turned negative. Add to the above, some very bad employment numbers and even the Fed’s own forecast growth for Q1 is now only .2%. Keep in mind, the Fed is using ridiculous inflation numbers well under 2%, if they were using the real number between 5-7%, they would be operating with a growth rate assumption of negative 3-5% or worse! Normally try not to “chart you to death” but I have just one more. The whole purpose of this exercise is to show you how the timing of each “QE” of the past fit in to the economic and financial picture. QE was used to flood the system with liquidity each time the markets began to weaken or revolt. 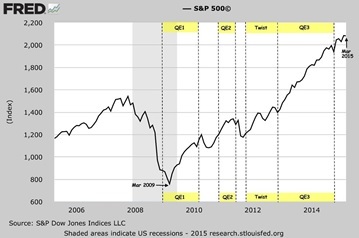 QE was not so much timed with the real economy, it has EACH time been more about the markets themselves. The following chart illustrates the action in the markets preceding, during and after each QE dosage. You will notice QE was introduced each time the market was weak, also notice that once QE was ended, the markets would again weaken and be followed by another round of QE. I believe we are again close to another inflection point. Stocks have not made new highs for several months, should they begin to weaken from here (they have every reason to), another dose of QE will be announced. The talk has been all about Fed tightening or raising rates, this is an absolute MUST for the Fed to regain any credibility. They cannot ever do this, they will be forced to do the opposite. Should the stock markets pull back and even approach a 10% correction, the Fed will be forced into QE4. Please understand why. Each episode of QE created more debt and more derivatives making the markets that much more levered with thinner margins of error. The “problems” that QE were originally introduced for in the first place have only been made more severe with each new episode. QE was never really about the economy at all, it was always about the banks and financial systems not imploding in a daisy chain collapse of the debt and derivatives. Once the markets sniff out a 10% pullback, QE will again be mandatory to try to reflate the system and push the ultimate ending into the future …kicking the can again so to speak. I believe the next QE will be the last one in our lifetimes for several reasons. The Fed will finally lose ALL credibility. Add to this, globally central banks and treasuries have destroyed their own balance sheets in their efforts to defy deflation. They can no longer be the solution as they are part, a very BIG PART of the problem. QE has distorted so many various markets so far from levels Mother Nature would endorse, something will snap in an out of control fashion …and QE has been all about “control” and not allowing markets to truly function and “set” prices. What I am saying is this, the grand experiment of QE is very shortly going to be “forced” into use again. I believe this will be a spectacular failure and one which history will remember for 1,000 years! My term for this last round is “QE4(n)evermore”. I say this because the monetary system will be broken, trust will be broken. The world began an experiment of global fiat money back in 1971, this will finally be proven to be the folly it has always been …and everyone on the planet (including Americans) will fully understand it. Any new currency which is introduced will by necessity have to have some sort of real backing to have “confidence”, without confidence any new currency will fail. History has shown us time and time again that the only currencies which retain trust or confidence have some sort of tie to gold and silver …or gold and silver themselves. No currency backed by gold or silver has ever failed …unless man himself fiddled and cheated with the weights, measures or the actual holdings of the metals themselves. Quantitative easing is the ultimate in “fiddling and cheating” …and this with currencies of no real value to begin with! In the most simple of terms, “It’s all been a scam”! Hi Bill, Caught your interview with Gregg Hunter. I must admit I like your double barrel approach. good dose of it. Thanks for the fine writing. thank you so much, please do! Bill, you should definitely get that name copyrighted. 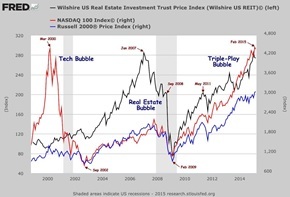 I like it and it makes immediate sense to anyone who has been a bystander watching stocks and real estate get all bubbly on us these last few years. Keep writing ’til you can’t. Confidence and trust in the USD has been already eroded among major global players. China’s AIIB has just proven this in spades. I almost feel sorry for the Wall Street players who, living in their own little criminal matrix, won’t have nearly enough time to exit their positions. they live in la la land. Great article, but I’m afraid most will never fully get it. If they ever did become aware there would be blood in the streets. The mental and financial fleecing of the sheep has always been the case and always will. 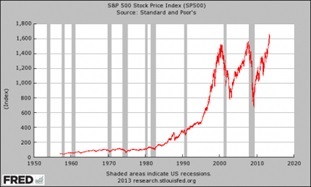 I listened to James Turk usawd, and he says stock market will soar after we have our economic collapse. I thought wall street was propped up by QE? He compared to Zimbabwe. dollar crash and how their stock market soared afterwards. I thought stock market, economic, and dollar collapse were synonymous. he is saying the stock market may go higher but, not as fast as the currencies drop. Zimbabwe as an example. I believe QE4 will come about as a reaction to a dropping market or even a crash, hyperinflation then is unleashed. sorry, but I just can quite wrap my brain around this. since AFTER the collapse, the Zimbabwe dollar soared, and ours will too, I should just stay in the market, not protect myself w/gold and silver, since he insinuates the stock market is the place to be after the collapse. I understood all this time, I was supposed to get out of dollars, keep a few, buy tangibles then get allot of gold, as the DOLLAR/FIAT IS really worthless. James Turk makes me to believe, wall street is the place to be. Dollar is backed only by fiat money printing, gold is suppressed, no manfg to prop the dollar, and we lose the reserve $ status, china backs the yuan with gold and all countries flee to aiib. dollar is toast, we are screwed. So I guess i buy gold silver, cash it in after it increases, change it to dollars get into wall st. on the collapse end. buy low sell high. you have it backwards, the Zimbabwe dollar went to zero, it did not soar. Their currency’s debasement was the reason for stock to go up …but not by as much as the currency fell. bail in? confiscation of hard metals and houses/private land? auction off all the military assets/secrets? sell part of the country land/state? or worse occupied by new land owner like HK was forcefully “taken away” once before? that is if somehow they have the wisdom and perhaps restrain not to blow it all up… something as idiotic and cowardice as MAD… surely the recent “malfunction” demo are clear testaments? curious as to what do you think? default and NOT PAY BACK in some way or another??? when US of A fell? is that what you think as “default” and no need of paying back? its a very sad ending one way or another. as you come to every individual point of choice. the news on Greece yesterday calling all debt after 2012 as “odious” is an example. How appropriate that the title of this article includes a reference to the hit show The Following where the charismatic leader of a cult leads his followers to slaughter unsuspecting people. At the site of each killing they drop a reference to Edgar Allen Poe, one of the first being the title Nevermore written in blood. do you insinuate I am leading people to slaughter? An outright collapse of the USA would be too dangerous to all the big players, so I imagine a lying cheating way will be found to provide a soft landing. We haven’t even gotten to capital controls yet, so there are tried and proven tools left to use. I see the USA sinking more like England did and feel China and Russia will try to help draw things out—– further. we’ll see Mike, I don’t foresee a soft landing at all, I don’t see how. QE and the dollar are what is known as unjust weights and measures. Know as an abomination before God! These mediums are used to steal from generations to generations. Sad thing is the FED has fed themselves off of the working troughs and fed the people lies. Bill super impressed with your blog is very direct and to the point. I have some stuff from the land of Oz that you might find interesting will send to you. Was wondering if you could answer this question for me, thinking that we are in the current financial land of LALA, Just say that the Fed calls everyone’s bluff and does not undertake QE4, but just lets things go on, excuse my poor economic brain put if they did this wouldn’t it leave a few people, and countries super exposed, and the Fed saying simply well we tried to make it right and couldn’t blame the bankers walk away somewhat unscathed? Thanks Al, yes that is an option but it will end in a 100% complete and total financial collapse …a little sooner than if trying another QE. so your sitting at the table with your poker face what would you do, I have thought that for a long time since QE1, that sadly the US is going to pull all the other down with it. Why would the FED be interested in Throwing down Double spades when everyone else has a royal flush. Tao of war in retreat is leaving nothing for the enemy to pick up, to help there advance. The FED is going to keep this thing going and blow China and Russia out of the water and not do anything as the dollar keeps on getting stronger and stronger, and then BOW the man with the spades shoots the dealer under the table. Not sure why everyone else thinks that these LALA land FED / Bankers are going to do any different, They fully intend to be the last man standing!!! That’s what i’m prepping for and so should everyone else. As you have said countless times these guys are playing for real. God bless us all.!! they will kick the table over. Bill this is my 2nd train of thought, the Fed lets the dollar get so strong that you just have to buy it, it becomes irresistible, it goes so high your mouth waters for it, China cant declare their gold stocks etc etc, then right when you think the dollar cant get any higher, Bang the fed steps in with a 1/4 % interest rate hike! just think of the collateral damage. Wont hurt Fed / US too much as they don’t have a manufacturing industry worth much anymore! China will go on a massive buying spree with overvalued dollars and wash their hands of them. Thanks again Bill. On a side note, the Swiss is issuing the world’s first negative-yield 10-year note. Why would investors want to pay interest on a bond rather than receiving the interest? How do they intend to make a profit, on anticipated appreciation that will presumably cover the paid interest plus more? yea bill that’s my point – but who do the Chinese wash there hands with, as the FED just put interest rates up to 3%, see my point?, Personally I think that the US $ will be the Last man standing!I have no doubt that these whacko’s are prepared to do it. Love all your writing Mr.Holter. However, as a Canadian I often feel left out as practically everyone credible online writes from a US centric viewpoint. If you get an opportunity could you dedicate one article to what’s going on north of the border? Cheers! thank you. Please call me Bill, the only “Mr. Holter” I know is my dad. I plan to do a piece in the next couple of weeks regarding gold and silver in foreign currency terms. Excellent! Look forward to it. Thanks Bill. Just watch. ‘Oh Canada movie ” on YouTube 1h 50 min. Why would the people with the extraordinary privilege of creating paper money out of thin air ever give it up? If people lose faith in paper currency it may not be regained for several generations. The paper creators will be out of business. Wouldn’t it be better for them to let the world fall into a deflationary depression, foreclose on productive property and assets and keep the game going? If faced with a choice of the economy dies or the value of their paper dies, I think they may choose to let the economy die. The money was never real to start with, so do they care if it is repaid? The mortgaged assets are the real prize, and the Fed can seize them and keep their phony money from loosing credibility. 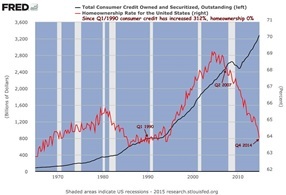 a deflationary collapse will make it so the Treasury cannot pay and the Fed’s portfolio upside down.